Merchant Robert Morris was a man of many distinctions. One of the wealthiest individuals in the Colonies and an economic wizard, he won the accolade "Financier of the Revolution," yet died penniless and forgotten. He and Roger Sherman were the only signers of all three of the Nation's basic documents: the Declaration of Independence, Articles of Confederation, and Constitution. Morris, who turned down appointment as the first Secretary of the Treasury, also served as a Senator in the First Congress. Morris was born in or near Liverpool, England, in 1734. At the age of 13, he emigrated to Maryland to join his father, a tobacco exporter at Oxford, Md. After brief schooling at Philadelphia, the youth obtained employment with Thomas and Charles Willing's well-known shipping firm. In 1754 he became a partner, and for almost four decades was one of the company's directors as well as one of Philadelphia's most influential citizens. Marrying in 1769 at the age of 35, he fathered five sons and two daughters. During the Stamp Act turmoil in 1765, Morris had joined other merchants in protest, but not until the outbreak of hostilities a decade hence did he fully commit himself to the Revolution. In 1775 the Continental Congress contracted with his firm to import arms and ammunition; and he was elected to the Pennsylvania council of safety (1775-76), the committee of correspondence, the provincial assembly (1775-76), the State legislature (1776-78), and the Continental Congress (1775-78). In the latter body, on July 1, 1776, he voted against independence, which he personally considered pre-mature, but the next day purposely absented himself to facilitate an affirmative ballot by his State. Morris, a key Member of Congress, specialized in financial affairs and military procurement. Although he and his firm profited handsomely, had it not been for his assiduous labors the Continental Army would probably have needed to demobilize. He worked closely with General Washington, wheedled money and supplies from the States, borrowed money in the face of overwhelming difficulties, and on occasion even obtained personal loans to further the war cause. Immediately following his congressional service, Morris sat for two more terms in the Pennsylvania legislature in the period 1778-81. During this time, Thomas Paine and others attacked him for profiteering in Congress, which investigated his accounts and vindicated him. Nevertheless, his reputation slipped. Morris embarked on the most dramatic phase of his career by accepting the office of Superintendent of Finance (1781-84) under the Articles of Confederation. Congress, recognizing the perilous state of the Nation's finances and its impotence to remedy it, granted him dictatorial powers and acquiesced to his condition that he be allowed to continue his private commercial enterprises. He slashed all governmental and military expenditures, personally purchased Army and Navy supplies, tightened accounting procedures, prodded the States to fulfill quotas of money and supplies, and when necessary strained his personal credit by issuing notes over his own signature or borrowing from friends. To finance Washington's Yorktown campaign in 1781, in addition to the above techniques Morris obtained a sizable loan from France. He used part of it, along with some of his own fortune, to organize the Bank of North America, chartered that December. The first Government-incorporated bank in the United States, it aided war financing. 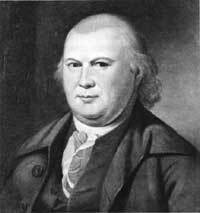 Although Morris was reelected to the Pennsylvania legislature in 1785-86, his private commercial ventures consumed most of his time. In the latter year, he attended the Annapolis Convention, and the following year the Constitutional Convention, where he sympathized with the Federalists. In 1789, declining Washington's offer of appointment as the first Secretary of the Treasury, he took instead a senatorial seat in Congress (1789-95). 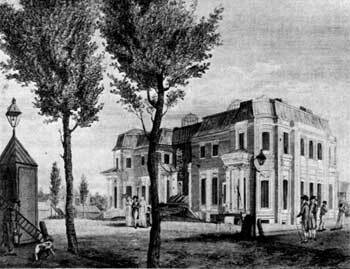 During the later years of his public life, Morris speculated wildly, often on overextended credit, in lands in the West and at the site of Washington, D.C. To compound his difficulties, in 1794 he began constructing on Philadelphia's Chestnut Street a palatial townhouse designed by Maj. Pierre Charles L'Enfant. Not long thereafter, Morris attempted to escape creditors by retreating to The Hills, the country estate along the Schuylkill River on the edge of Philadelphia that he had acquired in 1770. Arrested at the behest of creditors in 1798 and forced to abandon completion of the townhouse, henceforth known in its unfinished state as "Morris' Folly," Morris was thrown into the Philadelphia debtors' prison, where he was well treated. Nevertheless, by the time he was released in 1801, under a Federal bankruptcy law, his property and fortune had vanished, his health deteriorated, and his spirit been broken. He lingered on amid poverty and obscurity, living in a simple Philadelphia home on an annuity Gouverneur Morris had obtained for his wife. He died in 1806 in his 72d year. He was buried in the yard of Christ Church. Drawing: Oil, ca. 1872, by Charles Willson Peale, Independence National Historical Park.